Margin Call - What Does It Mean? What is a "margin call"? What is the definition of a "margin call"? What does the term "margin call" mean? 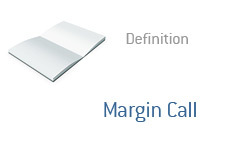 Before we define the term "margin call", we need to quickly define "margin". "Margin buying", for instance, occurs when you use borrowed money (from your broker) to purchase securities. So, if you deposit $50,000 into your account, your broker may give you an additional $200,000 of buying power. So, you could purchase $250,000 worth of securities even though you only had $50,000 in your account. This would be accomplished through the use of "margin". Now, brokers aren't going to leave themselves exposed if your stocks start to tumble, so they have "minimum margin requirements" in place. If your securities, which were originally bought for X, fall below Y, then the broker will give you a "margin call". Customers can meet these margin calls through a variety of different ways, including the moving of additional cash into the account, or selling off a portion of the position. If the customer doesn't meet the margin call, then the broker will start selling off positions in the customer's account until they are back up to the "minimum margin requirement" level. A "margin call" is also sometimes called a "maintenance call". The "margin call" (or maintenance call or whatever you want to call it) is not a fun thing to live through. What is a "Margin Call"? Thornburg Mortgage (TMA) To Go Under?